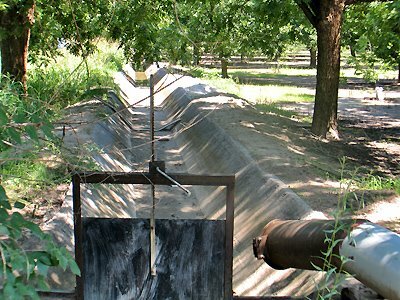 Research has indicated the best way to irrigate pecan trees is flood irrigation. 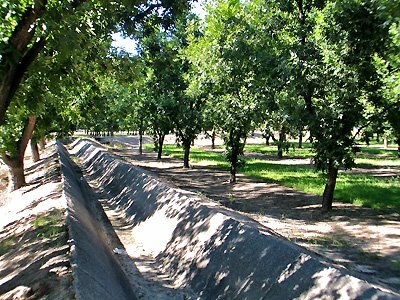 This may appear to be an inefficient use of water, but this method leads to deep irrigation that encourages the tree roots to grow deeply. The water available to the deep roots reduces the need for surface irrigation. 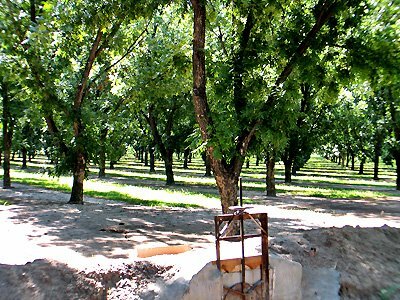 In DoÃ±a Ana County we have over 18,000 acres of pecan orchards. 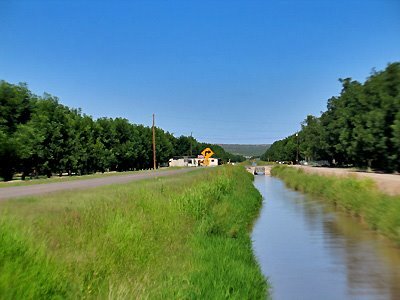 So this time of the year the back roads of the Mesilla Valley stretch through thousands of pecan fields being irrigated. The symmetrical planting of the trees creates endlessly fascinating views. But when you add the spectacular effects of sunlight glistening through the leaves and branches, and the reflections in the waters below, you have some of most remarkable visual delights ever seen. 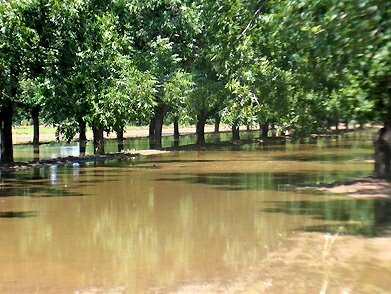 These photos were taken today of a pecan field being flood irrigated. Click on each image for a larger view. It’s almost impossible to determine where reality ends and reflection begins. Mesilla is criss-crossed with ditches and canals. 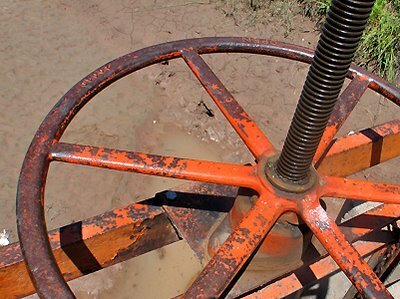 This irrigation system goes back to the founding of Mesilla. The Rio Grande is the source of the water. 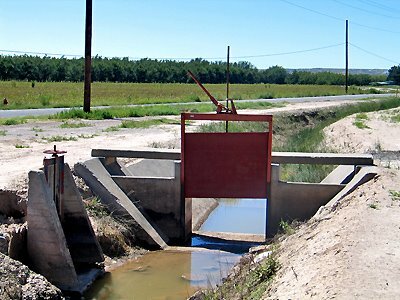 The gates enable the water to be directed to specific places at specific times in specific amounts. 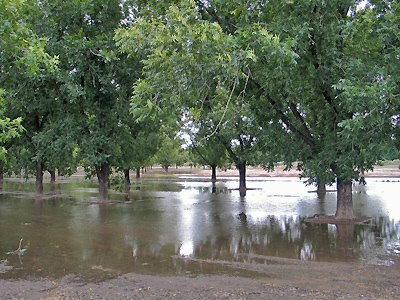 Pecan trees are irrigated by flooding, which is the only practical way to get water to the roots of the trees. 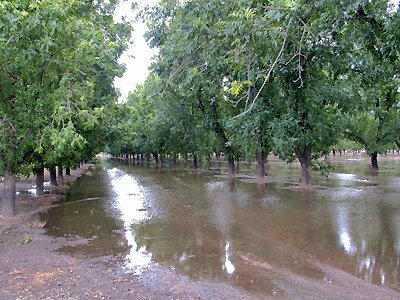 Flood irrigation may appear wasteful, but it actually encourages deep root growth, which in turn reduces the amount of irrigation water required by the crop. 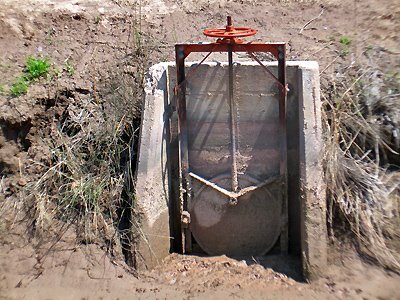 Irrigation existed before civilization. Irrigation was one of the fathers (or mothers, if you prefer) of civilization. But you are dependent upon irrigation for what you eat, and for much of what you wear. 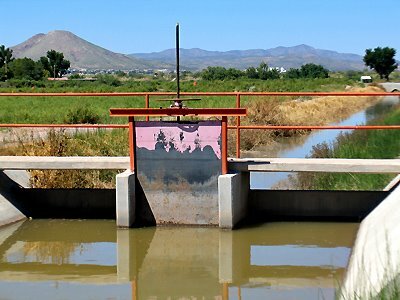 Irrigation is close in Mesilla, which still has its partnership with the land. 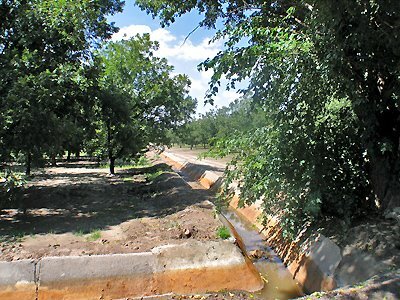 Many houses have 15 to 30 pecan trees and irrigation rights from the Rio Grande. Irrigation canals thread the Village. Here’s some of what you can see if you look. 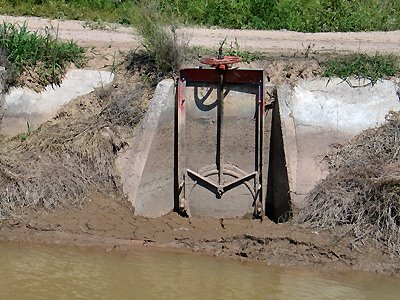 Cement canals prevent water loss into the ground, one of the goals of a Skilled Irrigator. Pecans are a huge agricultural industry around Mesilla. 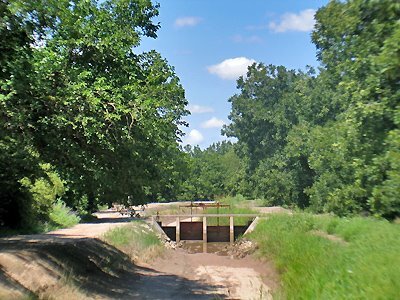 There are an estimated 18,000 acres of pecans in the county (DoÃ±a Ana). Pecans, because of their wonderful flavor, have been called the Cadillac of nuts. This is a wonderful time of the year to drive through the pecan groves. The trees are lush green and the patterns made by the sunlight, shadows, and rows of trees are dazzling. The pecans in this area are irrigated primarily with water from the Rio Grande. As a result, there are many irrigation canals feeding the groves.